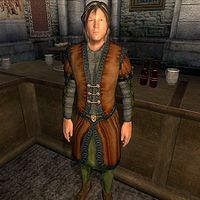 Ernest Manis is a Breton merchant and the proprietor of The Foaming Flask, a popular diner in the Talos Plaza District of the Imperial City. There are no beds for rent in The Foaming Flask, only food and drinks. He will stand behind the bar 24 hours a day, without ever eating or sleeping, tirelessly servicing the many customers from all over the big city. Ernest wears common middle-class attire consisting of a russet felt outfit and pigskin shoes. He also has a pair of burgundy linens, which he does not wear as the russet felt outfit covers the legs as well as the torso. In combat, he relies on an iron mace. He carries a small amount of gold. When approached for the first time, he says: "Welcome to the Foaming Flask. Good food, good drink. I'm Ernest Manis. Let me know what you need." If asked about the Imperial City, he replies: "I got no beds here. You need a bed in the Imperial City, you got four choices. The King and Queens and Luther Broads are in the Gardens. The Tiber Septim Hotel is very nice, but very expensive. There's the Bloated Float at the Waterfront. Sleep on a boat. And cheap, too." It is not possible to invest in Ernest Manis, even after you have reached 75 skill in Mercantile. Esta página foi modificada pela última vez à(s) 19h03min de 23 de julho de 2013.